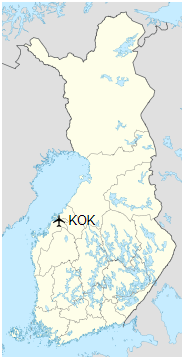 Kokkola-Pietarsaari Airport (Swedish: Karleby-Jakobstad flygplats, Finnish: Kokkola-Pietarsaaren lentoasema; IATA: KOK, ICAO: EFKK) is located in Kronoby, Finland, about 19 kilometres (12 mi) south of Kokkola city centre and 30 kilometres (19 mi) north-east of Jakobstad city centre. In 2010, about 80,000 passengers traveled via the airport. Scheduled serviced to Helsinki Airport is flown by Nordic Regional Airlines (Norra), operated as a code-share with Finnair. Finnair ended its own flights to Kokkola-Pietarsaari on 29 October 2010. 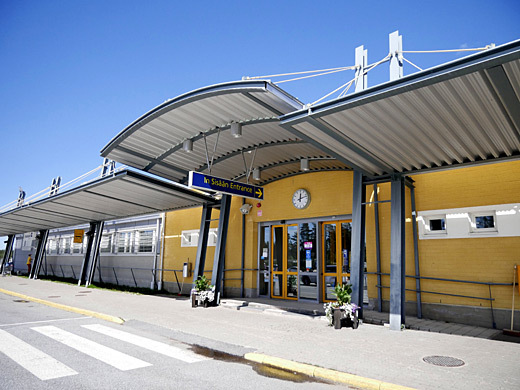 Flights to Stockholm-Arlanda Airport by Nextjet began on 8 February 2014, with some flights being operated via Pori Airport. During winters, the airport is also used by charter flight airliners with a destination to southern Europe. The airport has two runways. Until March 1, 2010, the name of the airport was Kruunupyy Airport or Kronoby Airport.